Yakult’s corporate activities are centered on the development, manufacture and sale of food and beverages, pharmaceuticals and cosmetics, and are conducted under the corporate philosophy of “We contribute to the health and happiness of people around the world through pursuit of excellence in life science in general and our research and experience in microorganisms in particular,” and based on the Shirota-ism principles of “preventive medicine,” “a healthy intestinal tract leads to a long life,” and “a price anyone can afford”. We are actively tackling a number of issues in building a sustainable society based on the belief that our corporate activities themselves are a social responsibility, as we believe that in order for people to be healthy, everything around them must also be healthy. I feel that nowadays there are growing social demands and expectations placed upon companies. As a global movement, the 2015 Paris Agreement and the UN Sustainable Development Goals (SDGs) have been adopted and become the common language for the world to achieve a sustainable society. In response to this movement, the Yakult Group has incorporated SDGs into its CSR framework, and this year’s report clarifies the links between the Yakult CSR Action Plan and each SDG, as well as the SDGs to which Yakult is contributing through its business activities. In this way, we have visualized the goals we need to focus on, and are proactively working to achieve them. Furthermore, both in and outside Japan there is a growing focus on ESG investment, which evaluates corporate initiatives for the environment, society and governance (ESG) — also the pillars of CSR — and non-financial information disclosure. Yakult Honsha is included in one of the Government Pension Investment Fund’s ESG indices, and moving forward we will respond to the expectations of investors who value ESG initiatives by promoting and actively disclosing our CSR activities. As we develop our operations in and outside Japan with this awareness of the importance of CSR, we will continue to work to contribute to the health and happiness of people around the world. The Group works in accordance with the seven core subjects of the global CSR standard ISO 26000, and based on our corporate philosophy of contributing to the health and happiness of our customers, current social needs, and other factors, we have made health, local communities, and the environment our three key areas of CSR, and organized the seven core subjects in the order, “I. Consumer Issues,” “II. Community Involvement and Development,” “III. The Environment,” “IV. Labor Practices,” “V. Human Rights,” “VI. Fair Operating Practices,” and “VII. Organizational Governance.” Additionally, we have established a CSR Action Plan that we actively follow while clarifying the relation with SDGs and ESG,. I will introduce a few topics within this system. within this system. In addition to delivering products that contribute to people’s health primarily via home delivery by more than 80,000 Yakult Ladies worldwide, the Yakult Group also carries out awareness-raising measures aimed at establishing healthy living habits, and activities that contribute to the community. In Japan, we actively dispatch guest lecturers to speak at elementary schools and other locations on the topic of intestinal health, and had over 270,000 participants in fiscal 2017. We also had over 380,000 participants in our health-related lectures for local communities held at community facilities, elderly care facilities, and Yakult centers (Yakult Ladies sales hubs). Furthermore, along with partnering with local governments to make Courtesy Visits to around 40,000 older people living alone, we also team up with 828 local governments, police and fire departments nationwide to run community safety watch and crime prevention activities, helping build safe, secure and comfortable local communities. Outside Japan we are also raising awareness on health, and contributing to the revitalization of local communities. As an example, in this report we introduce our initiatives in Mexico. Here in Japan, our Yakult Lady home delivery system was awarded the METI Minister’s Prize at the Second Nihon Service Award in June 2018, praised as a service that was born in Japan and is now familiar across borders and generations. Moving forward, we will further develop this world-class service system. In March 2018, we established our Policy on Community Development Activities, which clarifies the goals and aspirations of our wide-ranging community support activities. We will continue to expand and deepen our activities using this policy as a foundation. The pursuit of excellence in life science is the foundation of the Yakult Group. 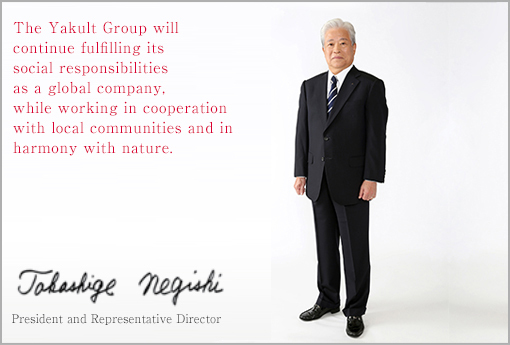 To drive innovation, we believe it is essential not only to promote research and development at the Yakult Central Institute in Kunitachi City, Tokyo, but to also collaborate with external organizations. One example is our joint research with the Japan Aerospace Exploration Agency that began in fiscal 2014. From fiscal 2017, astronauts on long-term missions on the International Space Station have regularly consumed probiotics to scientifically verify their effects on immune functions and the intestinal environment — the world’s first experiment on probiotics intake in space. We also promote initiatives to deepen understanding of probiotics through scientific events. In October 2017 we held the Nature Café symposium in partnership with Springer Nature, inviting renowned researchers to participate in a panel discussion. By holding such events, we are able to communicate our slogan ”Yakult, dedicated to science” both in and outside Japan, create a point of contact with global scientists, and promote understanding of probiotics around the world. We incorporate environmental activities at each stage of our operations under the three major themes of the Yakult Sustainable Ecology 2020 initiative: “realization of a low-carbon society” (in response to climate change), “efficient use of resources,” and “efforts to preserve and utilize biodiversity”. Responding to climate change can simultaneously be both a risk and an opportunity for our operations. Generally, an increase in natural disasters due to climate change can be considered a risk to operations and the procurement of raw materials. On the other hand, it is also an opportunity to build energy- and resource-saving production and distribution systems, promote initiatives such as environment-conscious packaging, and as a result receive positive evaluations from our stakeholders. To preserve and utilize biodiversity, we are actively engaged in greening activities around our institute and plants, and treeplanting activities overseas in countries such as China and Indonesia. Additionally, to raise environmental awareness among employees, we regularly run training sessions and campaigns. In fiscal 2017, we held a CSR campaign in conjunction with the Japan Committee for United Nations Decade on Biodiversity’s My Action Declaration program. The Group established its Statement on Health in September 2017. It further details our recognition that the health of our employees is both our social responsibility and essential to realizing our corporate philosophy of “contributing to the health and happiness of people around the world.” Specifically, along with promoting the streamlining of duties we maintain thorough labor management, and are working to reduce long working hours and improve the rate of paid holidays taken. In February 2018 these initiatives were recognized with certification by the government as a “White 500” company for outstanding health and productivity management. In April 2017, ISO 20400 was published, providing guidance on sustainable procurement, and coming at a time when there is growing attention on procurement that is environmentally and socially responsible. 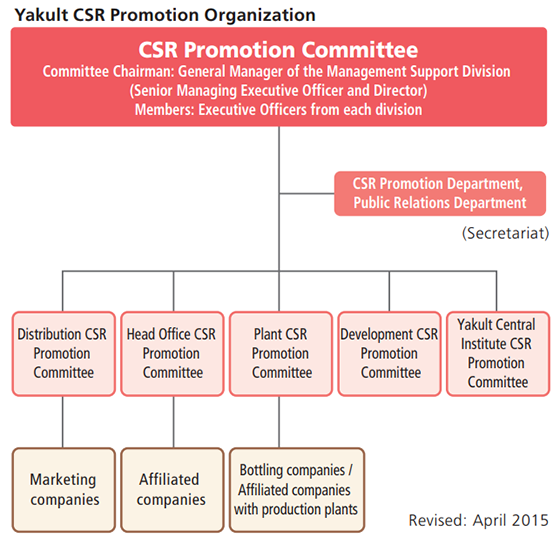 The Yakult Group established its CSR Procurement Policy in March 2018 based on these international trends. In corporation with business partners, we promote fair and equitable procurement activities throughout the supply chain while not only complying with national and local laws and regulations, and respecting international codes of conduct, but also considering human rights, labor, safety, and health. Furthermore, as a company widely trusted by our stakeholders, we promote transparent management by thoroughly ensuring compliance, practicing governance based on the objectives of the Corporate Governance Code, and actively disclosing information. As detailed above, we are strongly aware of our social responsibilities as a global company, and aim to achieve our action targets as a Group based on the key themes of the Yakult CSR Action Plan. Moreover, we will fulfill our social responsibilities by responding to ESG assessments and contributing to the achievement of SDGs. We welcome your candid feedback, and ask for your continued support going forward. We at the Yakult Group will implement corporate social responsibility (CSR) activities by generating tangible benefits in accordance with our corporate philosophy and realizing sustainable corporate growth. Specific CSR activities in accordance with this objective are articulated in our Basic Policy on CSR, which was formulated in April 2012.
beneficial relationships with all stakeholders. In order for the Yakult Group to take effective actions in the three key areas of CSR, from fiscal 2015 we have been systemizing our CSR activities in accordance with ISO 26000, the international standard for social responsibility. Specifically, in fiscal 2016 we formulated the Yakult CSR Action Plan, which clarifies the focus of our three key CSR areas in accordance with the seven core subjects of ISO 26000, and in fiscal 2017 relevant departments set concrete action targets and implemented activities accordingly. Additionally, we believe Sustainable Development Goals (SDGs) should be addressed as shared global challenges to achieve a sustainable society, and have included our approach to contributing to the achievement of SDGs in the CSR Action Plan. Specifically, of the 17 SDGs, we have identified those that are highly relevant to the Group, and after clarifying their relationship with the seven core subjects and key themes in the Yakult CSR Action Plan, we are implementing initiatives at each stage of operations. We have established a CSR Promotion Committee that is chaired by the General Manager of Management Support Division (Senior Managing Executive Officer) and made up of officers from each division. Members of the committee discuss policies and measures for promoting CSR and monitor the progress of each activity. Matters considered by this committee are brought up for discussion at the Executive Officers Committee when necessary.